Other Great Coupons and Deals! Directions for easy access for mobile phones. Located off of Town Creek Road and 129. You will come to a T before you have to turn! Road ends at stop sign take a left onto Cavender Creek Road. At stop sign take a Left onto TOWN CREEK ROAD. Go 1 mile and take a right onto FIRST paved road called Paradise Valley Road. 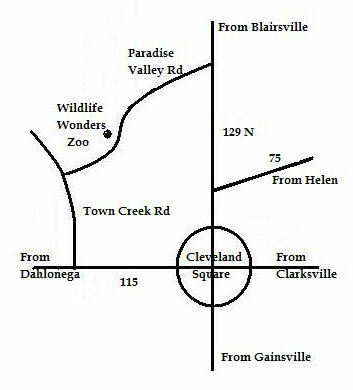 ZOO is on left 2912 Paradise Valley Road. Get off at the Cleveland/129 N exit. Follow 129 N into Cleveland. Turn L onto Paradise Valley road.Go approx: 3 miles. The Zoo is on the right. Paradise Valley road and follow the above directions. then follow the directions from 400. Turn R onto 129 north. 1 mile (from Alternate 75) or 5 miles (from 75). Looking for things to do in Helen. 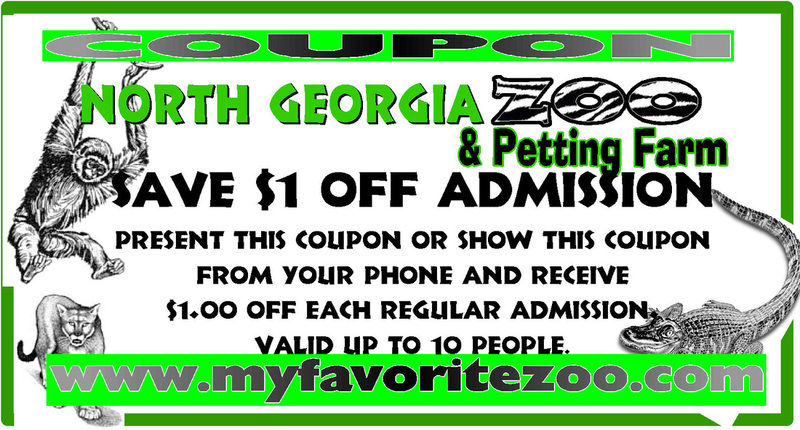 Why not Visit North Georgia Zoo and Friends. Helen including visiting North Georgia Zoo which is known as my favorite zoo. Georgia they always love coming to North Georgia Zoo. love coming to North Georgia Zoo.